So I’ve been documenting my running journey here and there, but I haven’t really described what I do and what works for me. I thought I’d go ahead and do that now in part because I want to keep a record of it and also in case anyone out there is wondering where to begin. This post will break down the gear I use, when I like to run and the races I have coming up. If you stick around til the end, I would love your input on music as my sound track is getting OLD. Deal? Ok, here we go! I don’t require much in terms of gear. I am just getting to the point in my long runs where I need a little energy boost. Right now, GU Chomps (I like the orange flavor) and water are where it’s at. If I am doing a long run, I will eat about half a pack somewhere about half-way through the run. At this stage, that means about mile 4. My husband got me the awesome iFitness Ultimate II running belt for my birthday. At first I thought I would only use it on the long runs, but I actually wear it during all my runs now. It’s really comfortable, doesn’t move and I can fit my phone, keys, Gu, and whatever else I might want with me. I just need to get the little water bottle add on and I’ll be set! In terms of what I wear and shoes, I have found that Old Navy sports bras are my favorites and my Athleta shorts and skorts are great for the summer months. I feel more comfortable in capri leggings, but it’s just too hot and humid for that nonsense. I have a pair of barely used Fila running shoes but they give me shin splints in about 4 minutes flat. I found a great deal on Brooks Pure Grit and I am in heaven! My next pair will likely be from the Brooks Pure line, but I might try something a bit better suited for road running. Still, I have had almost zero pain with the Pure Grit shoes and I love them. Because I am running the Princess Half Marathon in February, I’ve spent more than my fair share of time on the runDisney website reading and learning all about the races. Jeff Galloway is the official Trainer for runDisney and they have race-specific training plans you can import into your calendar. I reworked the beginner’s plan to fit the timing of my October race and grabbed the intermediate one to start later in the Fall. The plan is to run 3 times a week with the long run/walk on the weekend. The two weekdays are 30 minute runs and the weekend is a long run which increases over time. Once every few weeks during the weekend run, you time a 1mile “magic mile” to predict your half-marathon pace. I just did my first one this past weekend and I am right on track for my goal. Because it’s summer, I try to run before the sun rises. I don’t like running in full sun and it’s almost cool in the morning even though it’s August. Yes, it’s really REALLY hard to get up and out the door that early. But when I do it sets the tone for a great day. Some cross-training is encouraged but I am not very consistent with it. Some days I do Jillian Michaels’ 30 day shred, but those days have been few and far between over the summer. I don’t see myself running much more than training through the cold winter months. To be honest, I am a little worried about winter. As much as I complain about the heat, I have never been good at exercising outdoors in the cold months without having some pretty intense lung pain (burning). My hope is that because I am already training, it won’t be as bad as in years’ past when I would just randomly “try running”. Wishful thinking? Ok friends, this is where I need your help! I have a ridiculous mix of music that I run with including The Black Eyed Peas, Beyonce, Christian praise songs (Gungor) and Oscar’s VBS soundtrack (yes really). Clearly, I need a little help and that’s where you come in. 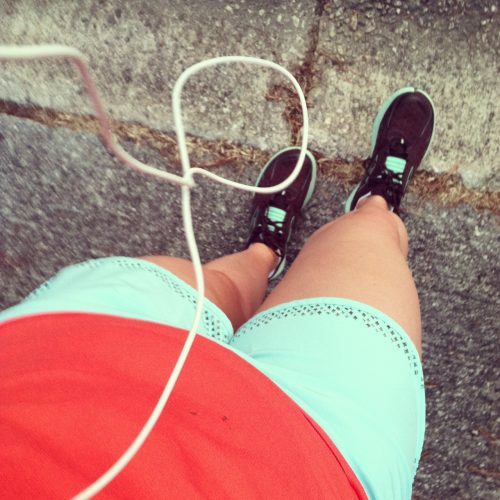 Have you made a running playlist? DO you know where I can find a good one? Here’s the thing about me and music, I am a radio girl or more currently known as a Pandora girl. I almost never know WHO the band is. I just like it or I don’t. I don’t have most albums so anything I buy will probably be just a song or two. I’ve seen pre-made playlists and I think that is what I will go with when all is said and done. Please leave me some suggestions so I can get this situation under control! Whew! So there you have it. So far I am really enjoying my running journey and I can’t wait to see where I will be next year. I am really proud of myself for sticking with it this long, especially since it isn’t really helping me lose weight. In the past, exercise was for one thing and one thing only – to get smaller. This time, I am running for strength, for my health and because I just want to. That’s pretty awesome. What about you? Do you have any tips or favorites to share? I’d love to hear them!